It’s fair to say that the majority of Hackaday readers have not built any hardware that’s slipped the surly bonds of Earth and ventured out into space proper. Sure we might see the occasional high altitude balloon go up under the control of some particularly enterprising hackers, but that’s still a far cry from a window seat on the International Space Station. Granted the rapid commercialization of space has certainly added to that exclusive group of space engineers over the last decade or so, but something tells us it’s still going to be quite some time before we’re running space-themed hacks with the regularity of Arduino projects. That being the case, you might assume the protocols and methods used to develop a scientific payload for the ISS must seem like Latin to us lowly hackers. Surely any hardware that could potentially endanger an orbiting outpost worth 100+ billion dollars, to say nothing of the human lives aboard it, would utilize technologies we can hardly dream of. It’s probably an alphabet soup of unfamiliar acronyms up there. After all, this is rocket science, right? There’s certainly an element of truth in there someplace, as hardware that gets installed on the Space Station is obviously held to exceptionally high standards. But Brad Luyster is here to tell you that not everything up there is so far removed from our Earthly engineering. In fact, while watching his 2018 Hackaday Superconference talk “Communication, Architecture, and Building Complex Systems for SPAAACE”, you might be surprised just how familiar it all sounds. Detailing some of the engineering that went into developing the Multi-use Variable-G Platform (MVP), the only centrifuge that’s able to expose samples to gravitational forces between 0 and 1 g, his talk goes over the design considerations that go into a piece of hardware for which failure isn’t an option; and how these lessons can help us with our somewhat less critically important projects down here. Check out Brad’s newly published talk video below, and then join me after the break for a look at the challenges of designing hardware that will live in space. If you happened to tune into NASA TV on December 11th, you’d have been treated to a sight perhaps best described as “unprecedented”: Russian cosmonauts roughly cutting away the thermal insulation of a docked Soyuz spacecraft with a knife and makeshift pair of shears. Working in a cloud of material ripped loose during the highly unusual procedure, cosmonauts Oleg Kononenko and Sergey Prokopyev were effectively carving out their own unique place in space history. Their mission was to investigate the external side of the suspicious hole in the Soyuz MS-09 capsule which caused a loss of air pressure on the International Space Station earlier in the year. That astronauts don’t generally climb out the hatch and use a knife to hack away at the outside of their spacecraft probably goes without saying. Such an event has never happened before, and while nobody can predict the future, odds are it’s not something we’re likely to see again. Keep in mind that this wasn’t some test capsule or a derelict, but a vehicle slated to return three human occupants to Earth in a matter of days. 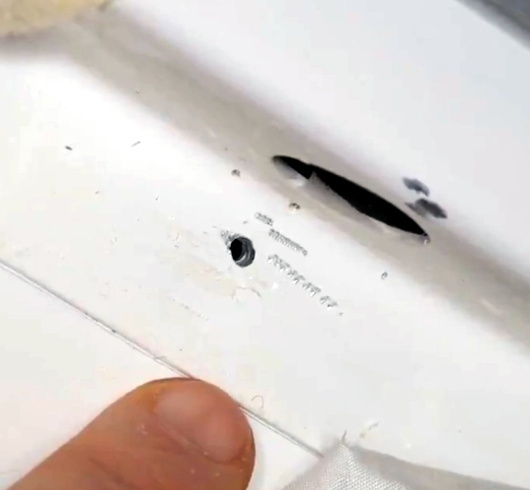 Cutting open a spacecraft in which human lives will shortly be entrusted is not a risk taken likely, and shows how truly desperate the Russian space agency Roscosmos is to find out just who or what put a hole in the side of one of their spacecraft. Close inspection from the inside of the spacecraft confirmed the hole wasn’t made by an impact with a micrometeorite or tiny piece of space junk as was originally assumed. It appears to have been made with a drill, which really only allows for two possible scenarios: intentional sabotage or a mistake and subsequent cover-up. In either event, a truly heinous crime has been committed and those responsible must be found. As luck would have it the slow leak of air pressure was detected early and the hole was patched before any damage was done, but what if it hadn’t? Getting people to space is extremely difficult, and while getting robots to space is still pretty challenging, it’s much easier. For that reason, robots and probes have been helping us explore the solar system for decades. Now, though, a robot assistant is on board the ISS to work with the astronauts, and rather than something impersonal like a robot arm, this one has a face, can navigate throughout the ship, and can respond to voice inputs. The robot is known as CIMON, the Crew Interactive Mobile Companion. Built by Airbus, this interactive helper will fly with German astronaut Alexander Gerst to test the concept of robotic helpers such as this one. It is able to freely move about the cabin and can learn about the space it is in without being specifically programmed for it. It processes voice inputs similarly to a smart phone, but still processes requests on Earth via the IBM Watson AI. This means that it’s not exactly untethered, and future implementations of this technology might need to be more self-contained for missions outside of low Earth orbit. While the designers have listened to the warnings of 2001 and not given it complete control of the space station, they also learned that it’s helpful to create an interactive robot that isn’t something as off-putting as a single creepy red-eye. This robot can display an interactive face on the screen, as well as use the same screen to show schematics, procedure steps, or anything else the astronauts need. If creepy design is more your style though, you can still have HAL watching you in your house. Thanks to [Marian] for the tip! The Russian space program experienced its first serious incident on a manned mission in 35 years when Soyuz MS-10 failed during ascent on October 11th, 2018. The abort system worked as designed, and crew members Aleksey Ovchinin and Nick Hague landed safely approximately 430 km from the launch site in Baikonur. Beyond being put through unusually high G forces, the two men suffered no injuries and will have their mission recycled for a future flight. From an abort standpoint, the event went as well as could possibly be expected. The fact that the crew walked away unharmed is a testament to the emergency systems on the rocket and spacecraft, and serve as a reminder of why these functions are designed into manned rockets even if they are rarely (if ever) used. The success is especially impressive considering the Soyuz’s launch abort tower, the solid fuel rocket designed to pull the spacecraft away from the failing booster rocket, had already been jettisoned before the event occurred. The spacecraft was instead pulled to safety by the secondary abort thrusters, which were added to the vehicle’s design in 1975 as a contingency and until now had never been used in a real-life scenario. But while the safe return of the crew was naturally the first priority for all agencies involved, the questions soon turned to the Soyuz itself. What caused the loss of the rocket? Is it a defect which could be present in the other Soyuz rockets currently under construction? Perhaps most importantly, when could the Soyuz fly again? As it’s currently the only way to put humans into space, the International Space Station is completely dependent on regular Soyuz flights, and a delay in the program could endanger the orbiting outpost. Now, with the initial findings of the Russian incident investigation being made public, we’re starting to get answers on some of those questions. The official report so far agrees with the conclusions many “Armchair Astronauts” made watching the live stream of the launch, and the evidence suggests that the core issue is the same which doomed previous Russian vehicles. Today’s failed Soyuz launch thankfully resulted in no casualties, but the fate of the International Space Station (ISS) is now in question. Just two minutes after liftoff, the crew of the Soyuz MS-10 found themselves in a situation that every astronaut since the beginning of the manned space program has trained for, but very few have ever had to face: a failure during launch. Today the crew of two, Russian Aleksey Ovchinin and American Nick Hague, were forced to make a ballistic re-entry into the Earth’s atmosphere; a wild ride that put them through higher G forces than expected and dropped the vehicle approximately 430 km from the launch site in Baikonur. Both men walked away from the event unharmed, but while the ordeal is over for them, it’s just beginning for the crew of the ISS. 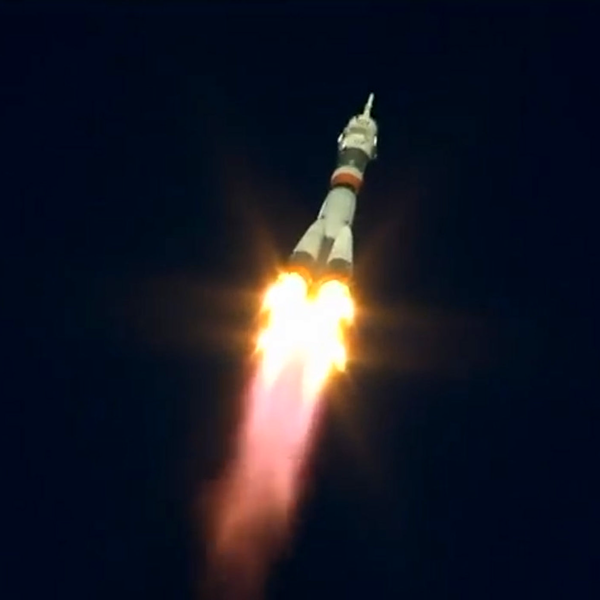 Until a full investigation can be completed by Roscosmos, Russia’s space agency, the Soyuz rocket is grounded. This is standard procedure, as they obviously don’t want to launch another rocket and risk encountering the same issue. But as the Soyuz is currently the only way we have to get humans into space, this means new crew can’t be sent to the ISS until Roscosmos is confident the issue has been identified and resolved. Soyuz MS-11, which would have brought up three new crew members to relieve those already on the Station, was scheduled for liftoff on December 20th. While not yet officially confirmed, that mission is almost certainly not going to be launching as scheduled. Two months is simply not long enough to conduct an investigation into such a major event when human lives are on the line. The failure of Soyuz MS-10 has started a domino effect which will deprive the ISS of the five crew members which were scheduled to be aboard by the end of 2018. To make matters worse, the three current crew members must return to Earth before the end of the year as well. NASA and Roscosmos will now need to make an unprecedented decision which could lead to abandoning the International Space Station; the first time it would be left unmanned since the Expedition 1 mission arrived in November 2000.